This post begins a series using the Alphabet to go through streets that were significant in my life, as part of the “Family History Through the Alphabet” challenge. I will start with Atkinson in Detroit. The layout of the house isn’t exact as far as scale, but it is as close as I remember it. The last time I was in this house was in 1953. I was 6 years old. Downstairs at 2212 Atkinson with photos. Scale is way off. In 1951, when I was four, my father received a call to St. Marks Presbyterian church in Detroit. We left Springfield, Massachusetts and moved into 2212 Atkinson, down the street from my paternal grandparents who lived at 2270 Atkinson. St. Marks was located a block away, in the other direction, on 12th Street. The 1967 Detroit riot started a block from the church. I attended kindergarten at Brady Elementary School. I was eager to start school and there were no tears or fear. I remember a cartoon with the white corpuscles battling it out with germs, painting everyday on the easel. I don’t remember my regular teacher but a substitute teacher stays in my mind. She was short and wore her white hair piled high on top of her head, kind of like a wedding cake. I remember her as wearing a purple dress and being mean. I walked to school by myself – two blocks down Atkinson, a short distance on Linwood to the light and a long block next to Sacred Heart Seminary. Usually there were no other walkers because I was late. I especially remember being late when I started first grade and came home for lunch. I must have been a slow eater because I was late just about everyday. I didn’t mind walking alone but I didn’t like being late. One day I was coming home for lunch and as I was passing the neighbors house, two girls around my age, were outside with their dog Duchess. The dog came up growling and caught my wrist in her mouth. They just stood there and I just stood there. Soon my mother came out and rescued me. She said she heard me calling her but actually I hadn’t said a word. My father kept a big stick by the door to hit Duchess with when she ran out to attack. Pearl and I shared a bedroom. For much of the time she was still in her crib. She was 2 or 3 when we moved. She would tell me stories about Oliver Olive and a tear on the wallpaper right over her crib that we called Tecumseh. Later, after I learned to read, I taught Pearl to read when we were supposed to be going to sleep. We had a little table over by the window and the street light gave us enough light. Out of our side window we would watch our neighbors, the two girls with the mean dog, playing in their fantastic attic playroom. We had to go to bed at 8pm all year long, light outside or not. They did not. When it was light outside and I was in bed, I imagined pictures from the folds in the curtains. We were not allowed to play outside of the backyard, even though I was walking alone blocks and blocks through rain and snow and sleet to school. There was a large screened in porch on the back of the house but we couldn’t play on it because it never got cleaned off and we would have tracked dust and dirt into the house. It was a really nice porch and I longed to play on it. But I didn’t. My mother bought us some easels and paint because I liked to paint at school so much and I used to paint in the basement when she was washing or hanging up clothes. We didn’t have a car and we took the 14th street bus to go downtown and to go over to my grandparents on the east side on Saturdays. There must have been a streetcar around there too because I didn’t get sick when we rode the streetcar but when we took the bus we sometimes had to get off and walk because I would be getting ready to throw up. My mother’s bank was on Linwood and I remember the black and white squares on the floor that my sister and I used to walk around on. Down the street was a Dime store where we use to buy tiny little dolls with tiny blue bath tubs and a comparatively big bottle. There were a lot of little toys but that is all I remember buying. The bank is now deserted and the rest of the block is empty. During first grade I told my mother I didn’t feel good one morning. She thought I was just trying to get out of school, although I don’t remember trying to get out of school, and made me go. By the time I came home for lunch I had a fever. It turned out I had pneumonia and missed half of that year of school. I was moved into my parents room and I guess they moved to the guest room. My uncle Louis, who was a doctor and lived down the street at his parents house came by to see me everyday. I remember him singing “Oh if I had the wings of an angel over these prison walls I would fly…” as he came up the stairs. For a while I had to use a bedpan and I remember holding on to the wall for support when I finally was allowed up. By the time I got to go downstairs it was like being in a new house it had been so long since I saw it. In 1953, my father was involved in a church fight and led a faction of 300 out to start another church which became Central Congregational Church, then Central United Church of Christ and finally The Shrine of the Black Madonna. My sister Pearl and I spent that summer with my mother’s parents on Theodore. My father stayed with his parents on Atkinson. In the fall we moved to a new parsonage on Chicago Blvd. Recent shot from Google maps. Upstairs of the parsonage. Unfortunately no photos outside of my mind. Other posts that relate to the house on Atkinson and St. Marks. Wow, that’s a whole host of anecdotal memories from your childhood that have just been saved by you recording them. Memories of the town where you grew up are always special, and it’s a great way to start the Challenge. That you for joining in. I had to stop myself because once I got started I remembered more and more. Thank you for coming up with the challenge. I enjoy reading about your life on Atkinson Street. I think that it’s amazing how much you remember about your experiences there given that you were so young. I was born in Detroit. I am very familiar with that neighborhood. I too lived around the corner from 12th street, on Hecla, during the riots. You wrote a book a few years back that described your time spent in Idlewild. I was intrigue enough to take the journey to Idlewild. The little town has come back to life. Thanks for sharing your story. Gwen, you are either thinking of my daughter (Ayanna Williams) who wrote a chapter in a book about homeschooling in Idlewild or my sister (Pearl Cleage) who wrote a novel that was set in Idlewild. I lived in Idlewild for 20 years, until 2007, but I never wrote a book about it. The summer life of Idlewild and the year around life in Idlewild are very different. I’m glad you enjoyed the post! Why is it that mothers always think we’re faking it?!? I’m glad too. I think antibiotics had just appeared. I remember taking something nasty tasting. I think mother’s have more on their minds then us. Maybe they wish they could fake it and escape. And, come to think of it, if I had wanted to miss, what would I have missed? I ended up missing half a year. I guess those shots came later. 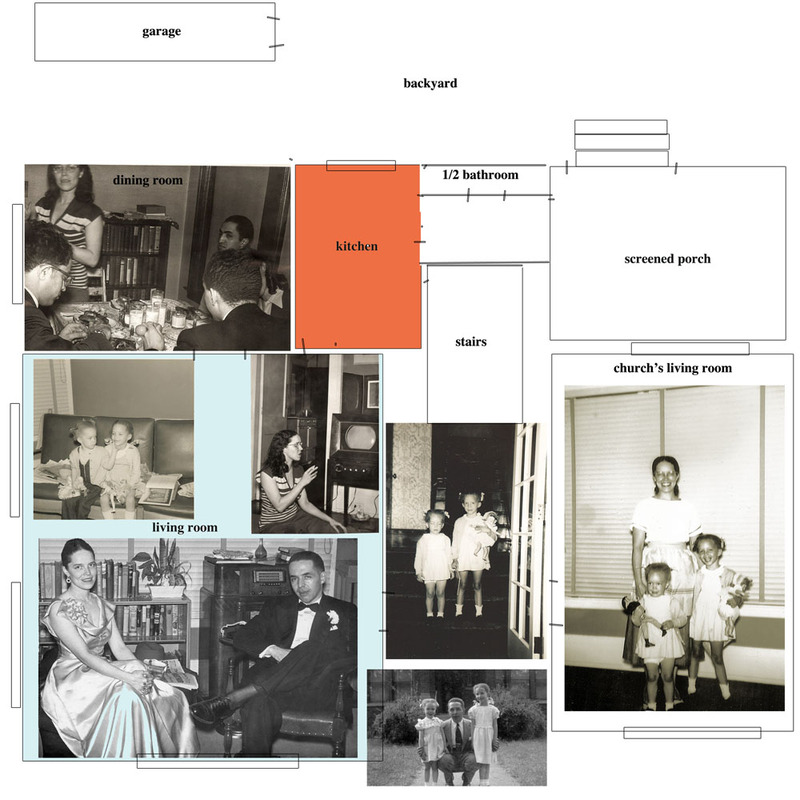 Kristin, I’m most impressed with how you superimposed the photos over the layout of the house. Amazing — and fun! I only wish I had one of the kitchen and the upstairs bedrooms. I guess I could draw them. Your grandparents house is one more house to the west/left as viewed on Google map. that curved walkway goes to the side entrance house to the east/right(they were also named Smith). The house directly across the street with the walkway to the west/left, the green awning and the fire hydrant was mine. I went to street view to confirm it. I don’t mean to critique the amazing work that you have done. I just enjoy recognizing some of your history an memories that overlap with my own. The reason it looks like Irene Smith (can’t remember her husband’s name but she was very active in the church so I remember her. Maybe his name was Herb?) is the one being highlighted is because of that tree covering my grandparents house. You have to go up or down the street a little and twist and turn to see the whole house. I am going to do a short post on that house this week too. I have a better memory of it because I was going in and out until the late 1980s or early 1990s. I enjoy the way your memories overlap mine and don’t take it as a critique. More like interactive memories. 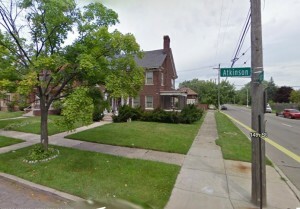 Do you remember the name of the people who lived on the corner of Atkinson and 14th? Their daughter use to babysit us sometimes and last year I remembered her name but now I’m getting a blank. Guess I better hurry up and write everything down! Her name was Elenor Gross! A year later and I remembered. What an amazing post. I can understand why, as you dug deeper and deeper, you kept remembering more and more. Plus seeing the memories via modern technology (G-Maps) makes it even more exciting. When I worked at National Bank of Detroit, my job was to supervise some of the branch bank offices. The Linwood branch was one of mine. I had to visit the Manager periodically on my rounds. I guess that was in the 1960s? Yes, seeing the places now and thinking about what was there then is something else. 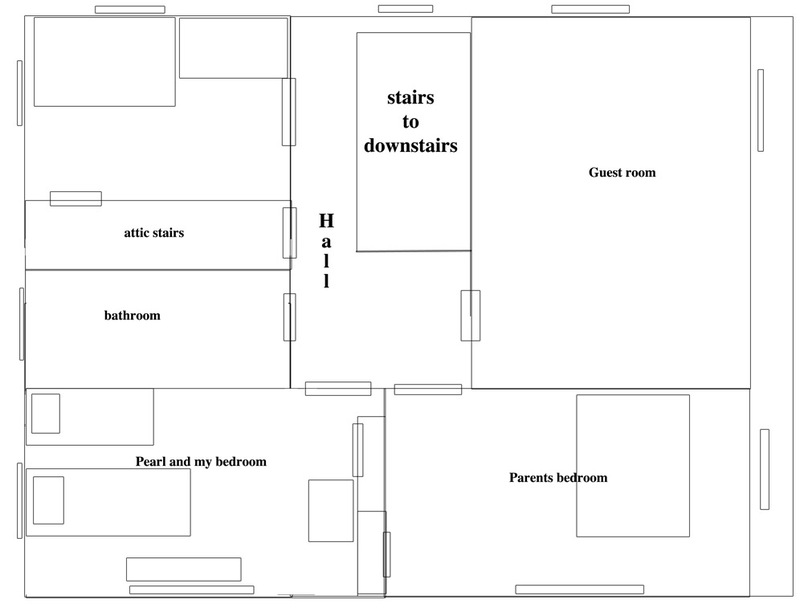 Wish I could have found an actual layout for the house online. It’s sad to see so many of the places that were a part of my every day life back then now gone and or pretty dismal. Fabulous photos and wonderful to see the house and its layout. What a boon for your descendants to have all this detailed information. Your beautiful written memories brought back childhood memories I have forgotten, a dog chase and faking illness when I first started school. Half a school year sick with pneumonia, thank God you survived. I was thinking after I wrote that, that my mother lost both her brothers in childhood, one to illness. That must have made it such a difficult time for both her and her parents. I had no idea I was on the verge! Wow, you are off to an amazing start with the A’s. I’m looking forward to the rest of the alphabet. You are so creative. I absolutely love the pictures embedded in the floor plan. It really makes the house come alive. Sorry I’m late coming along -catching up on reading. What a great idea you have here and I love how you’ve put in the house plans combined with photos…inspired choice! Don’t like the sound of Duchess at all….seems like she was a nasty little dog. You must have been really sick with pneumonia to be bed-ridden for so long. And my little sister got sick in the middle of me being sick. She wasn’t as sick but still, my mother must have been so tired and worried taking care of us all that time. I guess I was really tired but don’t remember anything hurting. I’m not from America but your article gave me an interesting insight on life there. Thank you. I’m glad you found it interesting. Where are you from? 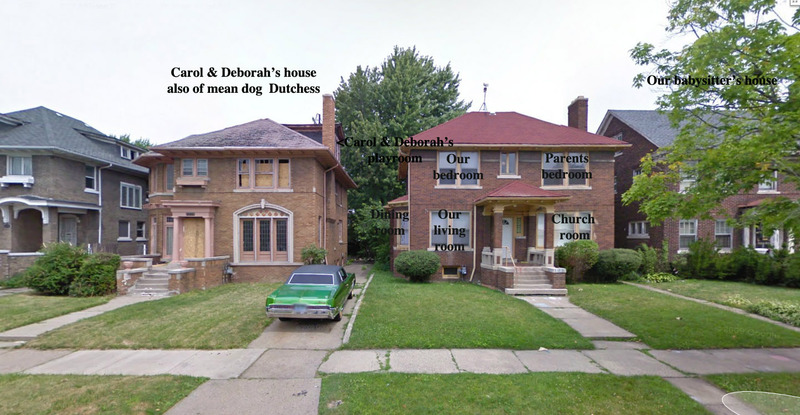 Your wonderful blog is a very important documentation of an aspect of African American life in mid-century Detroit. Never underestimate the significance of what you are doing, for our stories tell the tales that might never again be seen in our city, and might otherwise remain unknown – or even denied. Your site is a lovely witness to the Detroit that we knew; keep up the good work.